It is a well-known fact that the country of the Netherlands contains an enormous treasury of fine historical organs. 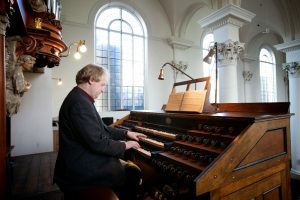 The Muller organ from the Bavo Church of Haarlem and the Hagerbeer/Schnitger organ from the Laurens Church of Alkmaar are world famous and also well-known in the UK, but there are much more beautiful instruments in Holland. 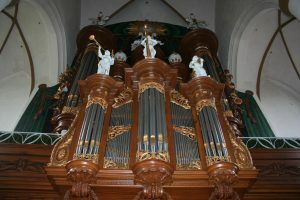 Obviously many Dutch organ lovers consider the Bavo Muller-organ as spoilt by the major restoration by Marcussen in 1962, and it is a fact that other Muller organs, as the older instrument from the Jacobijner Church of Leeuwarden (Friesland), has more “Muller-sound” left. In the course of the centuries many gifted Dutch builders and a big influx of German organ builders who combined their own traditions with the high developed Dutch organ style from the seventeenth century bless the country with a large amount of beautiful instruments. At the other side, lack of money, thrifty, and unchanged liturgical function in the nineteenth and first half of the twentieth century, are the main causes that so many organs survived, sometimes with minor changes, often completely unchanged. The presence of these organs is a main source of knowledge for Dutch organ builders as Flentrop, van Vulpen, Reil, Verschueren and others. They are the firms who in the meanwhile restored almost all the large and many of the smaller instruments so that they get back their original beauty and specifications and are now in a very good condition. It is also the reason that new organs are mainly build in a historical way, always with tracker action and sometimes with non-equal temperament. The maintenance of historical organs was not possible without the support of the Dutch government (“monument care” department) who has gives for years important financial support and protection by law. However restorations always faced delays due to lack of funds, this situation became much worse in the last years, due to the economical situation, combined with an increasing secularisation. In the future the role of non-government organisations like cultural private funds and sponsoring will become more and more important. 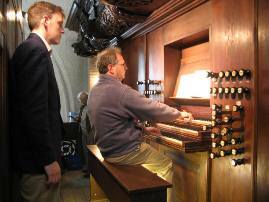 From 2005 to 2017 organ tours were organised to several famous Dutch organs, such as Alkmaar, Amsterdam, Haarlem, Leiden, Rotterdam, Purmerend, Harderwijk, Amersfoort, Zwolle, Kampen, Zutphen, Utrecht, Bolsward, Leens, Nijkerk and ‘s Hertogenbosch. In 2010 and 2015 the region Groningen was subject with visits to historical organs in this ‘organ garden of Europe’. Copyright © 2019 Dutch Organ Tours.